Heavy duty iPad Air 10.5 and iPad Pro 10.5 case! The best drop protection for the iPad Air 10.5 and iPad Pro 10.5 is here! Gumdrop's new Hideaway case offers multiple layers of custom molded, shock absorbing material to keep your Tablet securely protected. 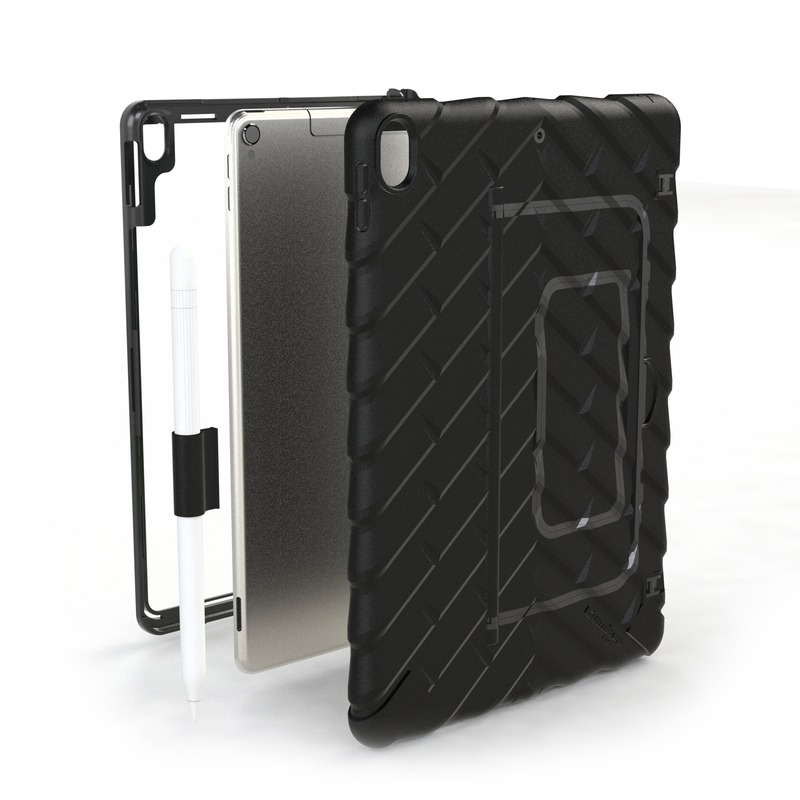 HEAVY DUTY CASE FOR IPAD AIR 10.5/IPAD PRO 10.5: The Hideaway case remains tough as nails, able to take repeated drops without breaking a sweat. KEEP YOUR IPAD LOOKING LIKE NEW: Keep your warranty intact! Dings, dents and cracks from daily abuse are prevented by the always-on thick bumper skin. The BEST protection for Kids. For the past 5 years we have only used Gumdrops on our iPads. I know the kids can drop them, bump them, and shove them in their bags without damage. Thank you! Good textured case. Goes on straight forward and I have not had to remove it to clean. This is the second one I have owned. Good value. The protective tabs hold up better than the Otter box ones on my iPhone. This is not water proof, just good for normal wear and tear and the occasional drop. This is an excellent case for the iPad Pro 10.5. It is essentially military-grade ruggedness, beautifully made, and fits the iPad perfectly. The rubber is thick, tough, and has a pleasing texture when you carry the iPad Pro around. The stand is attached with a strong magnet, and it functions to make the iPad Pro 10.5 essentially a portable notebook computer if you have a bluetooth keyboard to go with it.I give this one 5 stars because of the quality of construction, good design, and overall price/quality. Here are a couple of things to know, however. Firstly, this case does not allow the use of the Apple Smart Keyboard -- it covers the magnetic interface. This case requires you to use a bluetooth keyboard if you wish to use an external keyboard. I had an extra Apple Magic Keyboard around, so I was OK with this. Just know that this case is not compatible with any magic keyboard.The other thing to know is that I did not like the built-in screen protector that this case comes with. It is definitely inferior to the various glass screen protectors that are available. The case's own screen protector is easily removed, and I recommend that most iPad fanatics (I am one) will want to use a different screen protector.This is an excellent case. It is rugged, protects the iPad Pro 10.5 very well, and fits like OEM equipment. RJB. A great case. Durable, heavy duty...a kickstand! It protects your iPad like a tank. Adds some weight and bulk to the unit, though.